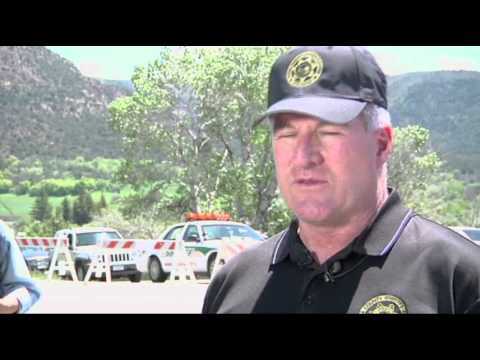 Published: May 27, 2014 12:00 am Updated: May 27, 2014 9:39 a.m.
COLLBRAN, Colo. — When a Colorado rancher noticed his irrigation ditch had stopped running, three men from this close-knit town volunteered to investigate. A small mudslide was found to be to blame for the water cutoff, and when the three men went to check on the damage on Sunday, a huge chunk of the ridge sheared off, likely overwhelming them. The men — a county road worker, his son and another man — remained missing Tuesday after an all-day search of the lower portion of the Colorado landslide, which measured a half-mile at the top and trailed some 3 miles downhill. Heather Benjamin, a spokeswoman for the Mesa County Sheriff's Office, said early Tuesday that the ground's instability continued to hamper searchers and that it was not yet clear when they would be able to resume work Tuesday. No structures or roads were affected in the remote area of western Colorado, about an hour east of Grand Junction. A drone was used to try to detect heat sources from the missing near the edge of Grand Mesa, one of the world's highest flat topped mountains. The Mesa County Sheriff's Office identified the missing as Clancy Nichols, 51, a county road and bridge employee; Danny Nichols, 24, Clancy Nichols' son; and Wes Hawkins, 46. Clancy Nichols' brother, Bill, says he's holding out hope they survived the slide. "We're praying for their safety," he told KUSA-TV. "We're praying for the safe return of the family members of Wes' family and for Clancy and Danny to come back." Hawkins' cousin, Bill Clark, said Hawkins went along because he works for an area water district. He said Hawkins has a family and young children. Residents and Mesa County Sheriff Stan Hilkey said they were praying for a miracle. "How can anybody expect or see something like this coming? Or happening like that? 'Cause they were just up there checking the water, afraid of losing the county road," said Clark. Hilkey said the slide was most likely triggered by runoff from Grand Mesa following two days of strong rain. The mud and debris are 20 to 30 feet deep at the edges of the slide near Collburn, and it's believed to be several hundred feet deep in some parts. The slide is larger than the Washington State landslide that killed at least 43 people. That March 22 landslide swept a square mile of dirt, sand and silt through a neighborhood in Oso, about an hour northeast of Seattle. From a distance of about 10 miles, the Colorado slide looked like a funnel, narrowing into a culvert below. It cut a giant channel through trees. A creek that once gradually flowed down the ridge now spurted down like a waterfall. "How in the devil could this happen?" said Collbran resident Lloyd Power, gazing out at the slide.